Splitting hands in blackjack can be a tough decision and can be the catalyst for making or breaking a game. Although rules can differ between game variations, blackjack players are always given the option of splitting their hand when dealt a pair of cards of the same value/rank. If a player does decide to split a pair, they will be dealt two additional cards, one for each new hand, ultimately creating two separate hands now in play. Each of these hands are then played as you would a standard single hand. When splitting a hand, players are required to put down another bet (of equal value to their original wager), to cover their new hand. Many players are put off by this requirement, but if the right strategies are engaged, splitting pairs lowers the house edge and can be a lucrative investment. It’s advisable players try and keep enough chips aside so if the promising option to split hands arises, the cash is available to do so. Have a go splitting hands at online blackjack sites like All Slots Casino. Standard blackjack rules generally follow the same guidelines when it comes to splitting pairs, the main difference being limitations on how many times players can re-split a hand. Rules vary between online blackjack games and land based blackjack games, with online games typically more lenient than offline variants. Of course, online 21 is only available as an option for our international readers, as online gambling is currently banned in Australia due to the Interactive Gambling Amendment Bill, which went into effect from September 2017. Always refer to the individual rules of the game you are playing. It is also worth noting the dealer never splits or doubles. Splitting unlike 10-valued cards – This rules differs from game to game; in some variations of blackjack (typically American variants), you will be able to split unlike 10-valued cards (those which are valued at 10 but aren’t identical), such as a Jack and a King or a 10 and a Queen. Although, as we detail below, a pair of 10s should never be split, according to correct strategy. Re-splitting pairs – this refers to the amount of times a player can continuously split a pair and occurs when a player receives a pair, decides to split their hand, and is then dealt another pair. Most blackjack games allow players to re-split up to a maximum of three times. The common variation to this rule is players can’t split pairs more than once per round. When splitting pairs multiple times, an equal wager to the initial bet is required every time the hand is split. Splitting aces – a common rule variation is if a player splits a pair of Aces, they have to work with the cards they are then dealt and cannot re-split, double down or hit again. This may sound like a deterrent, but splitting a pair of Aces is always advisable as it increases the chances of drawing to 21. Double down – to “double down” or simply “double” means to place an additional wager on your hand, equal to your initial bet. Not all games will allow a player to double down after a split. If the game allows for a double down after splitting, it is advisable to do so when dealt strong hands, as this wager option can bring in some high rewards if played right. Placing a double down bet after splitting a hand reduces the house edge by 0.13%. 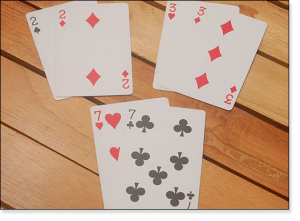 Blackjack strategy suggests if the game allows a double down after splitting, then we should split a pair of Deuces, Threes and Sevens so long as the dealer’s face card is a Deuce, Three, Four, Five, Six or Seven. 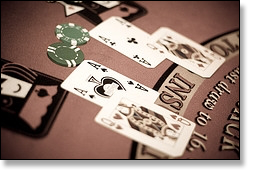 As with a majority of casino table games, your betting options will be far greater when playing online. Online blackjack allows for a lot more leniency when it comes to re-splitting hands than you can expect to find in a brick and mortar casino. Real life casinos will generally restrict additional play when splitting aces, with a variety of online games not as strict on this rule. Playing online also allows for lower minimum bets, so players with smaller bank rolls are able to test the waters a bit more with blackjack strategies applied to splitting pairs. One undisputed strategy at any blackjack table, be it online or real life, is to always split on a pair of aces. In blackjack the player has the choice to play the Ace at a value of either one or eleven, so splitting hands brings a higher possibility of drawing at least one winning blackjack hand with no possibility for a bust. A pair of aces is therefore the most popular hand to split. Likewise, players should never split a pair of tens (or face cards) as the chances of beating the dealer based on this current hand is already significantly high. These trusted sites offer free blackjack in practice mode, too, so you can try these strategies risk-free before moving on to place real money wagers. Real money deposits and withdrawals are available in your local currency using a range of secure payment methods, with a large range of blackjack titles and rule variations on offer. Follow our links to register and you’ll also receive some awesome welcome bonuses upon signing up.